Director Annabelle Comyn reunites with her The Talk of the Town leading lady Catherine Walker for Mark O’Rowe’s new version of Henrik Ibsen’s 1891 classic. Hedda Gabler (Walker) returns from a six-month honeymoon with husband Jorge Tesman (Peter Gaynor), who has tried her patience with research trips to libraries. But at least in libraries she didn’t have to endure Tesman’s beloved Aunt Julle (Jane Brennan) or maid Berte (Deirdre Molloy). Life in this new house looks set fair to be awful, apart from the visits of her former lover Judge Brack (Declan Conlon), and then the forecast gets even stormier. Former schoolmate Thea Elvsted (Kate Stanley Brennan), who Hedda despised, arrives desperately seeking Ejlert Lovborg (Keith McErlean). Hedda is initially intrigued, Lovborg being a lover she’d once threatened to shoot, but then quickly appalled when Brack reveals Lovborg’s new-found sobriety has enabled him publish a book so acclaimed he may pip Tesman to the professorship he was promised, and so ruin Hedda’s prospect of prosperity. O’Rowe’s version brings a Mametian sensibility to bear on Ibsen’s dialogue, which suddenly erupts in overlapping, interruptions, and back-tracking. He also dials down the black comedy that Brian Friel memorably mined from the script. 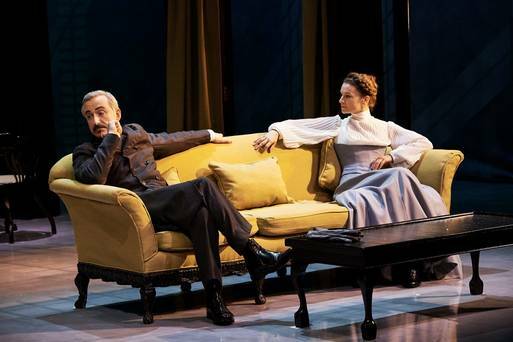 O’Rowe’s Hedda Gabler remains darkly humorous, but not as riotously funny as Anna Mackmin’s production of the Friel version I saw in the Old Vic in 2012. Half the fun of seeing the classics is seeing how different elements are highlighted by different productions. Peter Gayor is very impressive as Tesman. Whereas Adrian Scarborough rendered Tesman a joyous figure of fun, childlike in his enthusiasms and disappointments, Gaynor makes Tesman comically oblivious to Hedda’s pregnancy, but a serious academic whose conscience-stricken anger is sincere and fiery. Darrell D’Silva Fassbendered as a thoroughly roguish Brack, whereas Conlon renders him as a droll, urbane, and, eventually, inert presence. The performances follow the version: where Daniel Lapaine emphasised the depraved menace of Lovborg, McErlean is a chastened, sensitive presence as the academic in search of redemption. Sheridan Smith brought her comedy chops to bear on the part, but Walker’s Hedda is a more tragic figure. O’Rowe’s provocative addition that everything she touches ends up “grotesque, vulgar, and f****** farcical” underscores her exhaustion at the bourgeois world she’s trapped in despite her best machinations. Comyn’s regular set designer Paul O’Mahony eschews his usual impressively realised sets and places the furniture of a drawing room centre-stage, with free-standing doors delineating where an imaginary garden and hallway exist on either side. It’s reminiscent of the nightmare of an open-plan house in the finale of Fincher’s Dragon Tattoo movie, and makes lighting designer Chahine Yavroyan’s ‘sun’ streaming in from the garden particularly striking. The backdrop is a giant video screen on which Hugh O’Connor’s images and sounds, which fatally reminded me of U2’s ZOO TV, appear during scene changes. Perhaps it’s the white noise inside the head of Hedda? Who knows? Par the poster where Hedda sits on a chair under a plastic cover, no matter how well we can see Hedda, we can never see her clearly. O’Rowe’s version hammers home that Hedda is not as brilliant a manipulator as she thinks: she has been trapped in this house by an idle remark, just as an impulsive gesture with Lovborg will trap her. And the gesture which she thinks secures her position as a professor’s wife backfires spectacularly as this production makes it plain that Thea is the perfect wife for an academic, and her seriousness is the perfect match for Tesman. Annabelle Comyn draws impressive performances from her cast as always, but she also zips the action along as Hedda is brought low by her own headstrong nature; rendered on farce and tragedy’s uneasy borderline. Hedda Gabler continues its run at the Abbey until May 16h.